A BRAVE NEW WORLD OR A NEW WORLD ORDER? | SNinternational. A BRAVE NEW WORLD OR A NEW WORLD ORDER? The much heralded General Election is over and the result you could say is Status Quo minus Liberal Democrats! However, that would be to ignore the seismic shift of over 1 million voters plus who moved over to the SNP. This gave the map of Scotland a yellow band from north to south with only a sliver of orange(lib Dem in Shetland and orkney long a liberal place politicially) and sliver of blue in the far south west the only surviving TORY (Conservative) in Scotland. The Labour stronghold for over a century disappeared you might say overnight. However that too is siplistic given the recent Referendum on Independence. The betrayal of the Scottish Labour having to work on the Better together team under Alistair Darling and Gordon Brown was a move too far and the close result indicated a shift might happen in the forthcoming election. The runes were cast you could say. In the lands south of the border another shift of nearly six million voters was almost imperceptible as the result was only 1 MP for the UKIP. However, this may well be an indicator of how a referendum on getting out of europe may go in 2017. The narrow majority of the Conservative party shows that they only really have one third of the total voters on thier side and they would be silly indeed to ignore that and will do so at thier peril. If for instance an anti europe movement south of the border wins the day and a pro europe Scotland does not want to leave then bazinga! another Scottish referndum could be triggered! Referenda are not once in a lifetime events when a whole electorates future is dependent on some issue which is unresolvable in parliament with a large majority to carry the day then Referenda are the way forward. Devolution in 79 failed, however a couple of decades later it was a reality and a Scottish Parliament was Born! In regards to Europe there have been other referenda and again the way forward decided. The issues facing the UK however are not simple local but Global and as the dust from the results were settling and the other side of the map in Russia a celebration of the end o f the World War II took place. It was worth noting that Chancellor Angele Merkle attended the ceremony in Russia which is much to her credit given the current situation globally as the USA seek to create a second cold war! Interfereing in Ukraine to destabilise the peace there in the first place and allowing and backing of all things a NAZI GOVERNMENT whose prime minister even visited the German parliament and insulted them by berating them for allowing the defeat of Hitler. 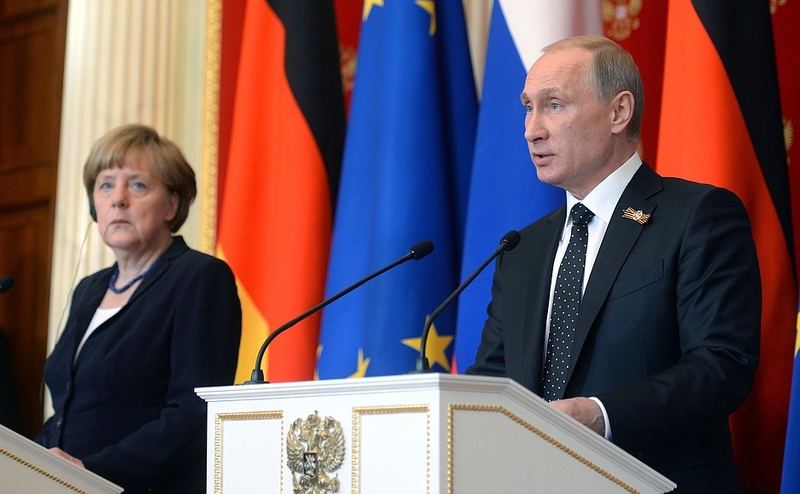 Putin And Merkle gave a press conference and below is the speech by Vladimir Putin , President of Russia. Thr british media predictably only concentrated on the negative so please read it all you may be surprised. Today, Ms Merkel and I laid wreaths at the Tomb of the Unknown Soldier and honoured the memory of the victims of the Great Patriotic War, which was such a tremendous tragedy for the entire world and for our nations. We stand in agreement in our assessment of these events and on the historical lessons to be learned. Today’s joint ceremony reminds us of the difficult road that Russia and Germany traversed in the name of reconciliation. We went from bitter, hardened feelings to mutual understanding and cooperation. I am grateful to the Federal Chancellor for her sincere words of regret over the crimes that Nazi Germany committed against our citizens. The Federal Chancellor and I held substantive talks and discussed a broad range of bilateral and international matters. It is no secret that Russian-German relations are not going through the best of times due to our differing positions on the events in Ukraine. Our bilateral trade decreased by 6.5 percent in 2014 – the first drop in the last five years. The drop exceeded 35 percent in the first two months of this year. This situation is not in the interests of either Russia or Germany. In this respect, I must say that the business community in Germany itself would like to see the lifting of these artificial barriers to developing our mutually advantageous trade and economic ties. Businesspeople are pragmatic by nature. They are therefore not leaving the Russian market and are assessing the current opportunities for doing successful business here. More than 6,000 German companies have a presence in the Russian market, and total accumulated German investment in the Russian economy comes to more than $21 billion. I remind you that around 100 German companies took part in just the single project of preparing the infrastructure for the Sochi Olympic Games. They had contracts worth a total of 1.5 billion euros and they performed the work and received the money as agreed. There are other areas where the cooling in our bilateral relations has affected our business ties. But there are also areas that continue to develop. Interregional cooperation is one such area. For example, 23 Russian regions have solid ongoing contacts with 14 regions in Germany. A large conference of twin cities is scheduled to take place in Karlsruhe at the end of June, and around 100 pairs of twin cities are expected to attend. We are developing our cooperation potential in the cultural and humanitarian sphere. We are now summing up the results of the reciprocal years of the Russian and German languages and literature, which took place in 2014–2015. Around 200 events were organised as part of this programme, many of them focused on our two countries’ youth. This prompted the idea of organising a year of youth exchanges in 2016. I think this is an important initiative with a focus on the future. I want to remind you that our countries have succeeded in pursuing constructive cooperation in much tougher conditions and more difficult times than the situation today, times when it seemed that insurmountable ideological barriers divided us. There were plenty of positive examples of cooperation back then. I will not go through them now, I think that you are all familiar with them. Naturally, our discussion of the international agenda focused primarily on the situation in Ukraine. Ms Merkel and I are in regular contact on this issue, including through our joint discussions with the Presidents of France and Ukraine in the Normandy format talks, which has shown itself to be quite an effective instrument for international facilitation of a peaceful settlement for the conflict in the Donbass region. Yes, it is true that we differ considerably in our assessment of the events that led to the anti-constitutional coup in the Ukrainian capital in February 2014. But at the same time, I am sure that you will all agree, and the participants in the peace talks say this constantly, that there is no alternative to a peaceful diplomatic solution. To achieve this, we must fully and strictly abide by the Minsk agreements reached on February 12 this year. I remind you that peace settlement measures form a package that ties together all of the key aspects for a settlement: political, military, socioeconomic and humanitarian. I think that we have every reason to say that the Minsk process is making progress, not without difficulties along the way, but it is moving forward. You know that after February 12, in spite of all the problems in southeastern Ukraine, the situation has been quieter there, even if there are still the problems that we know about. I firmly believe that the only way to guarantee a reliable and lasting settlement is to organise direct dialogue between Kiev, Donetsk and Lugansk. I think this is one of the key conditions for a settlement in general. I also think it essential to lift the economic embargo, restore financial and banking ties, and carry out constitutional reform with the southeastern regions’ involvement. The Minsk Agreements of February 12 cover all of these areas, and as I said, they must be implemented. We are happy that after the Normandy format consultations on April 30, when we had another telephone conversation, the four sub-groups set up to address specific areas of the settlement process began their work in Minsk on May 6. We will do everything possible to make their work effective, though success here depends above all on the people who have power, above all the authorities in Kiev. We will exert all possible influence on the authorities in Donetsk and Lugansk in order to ensure that this process goes at the hoped-for speed and quality. 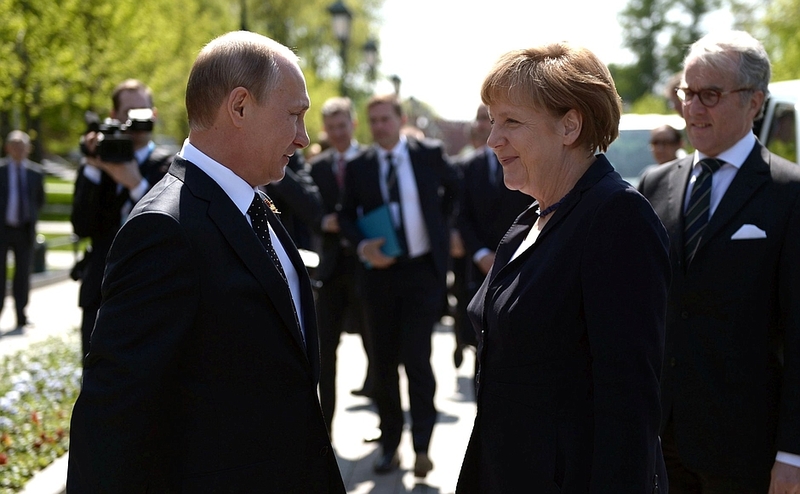 Ms Merkel and I agreed to work more closely on the crisis in Ukraine, including through the Normandy format. We also discussed our bilateral relations and spoke about the need to continue our talks on Ukraine’s association agreement with the European Union with respect to its impact on our economic interests. I want to inform you that a Russian delegation headed by the Economic Development Minister will go to Brussels on May 17–19. In the current world stage politics of War and hate are sadly on the ascendency throughout the Middle East in places like Iraq, Syria, and the larger problem of ISIL as well as the Yemen fighting is rife. NATOs illegal destruction of Libya under the Gadaffi regime has pushed a modern country to the brink of the middle ages with massive infrastructure destruction cusing up to 10 hour power cuts and Gaddafi AIDS!” little surprises this journalist. The Iraq war begun by riding roughshod over democratic issues in both USA and UK by w’s sidekick Blair (both war criminals if there is any justice left in this world) and the destruction of Afghanistan to restart the drug trade after 9/11 (many more now in USA, believe was an inside job!) The paper trail is there but hidden but that is why people of integrity like Snowden are such a danger to them! Also Julian Assange. Strangely enough when these people are in power they fail to eliminate the paper trail. So they spy on us to flag up if we might be getting too close for comfort. With an American Election and a Scottish Election next year The world faces a decision which radically changes the future as I titled this article a Brave (peaceful) new world or A New World Order (constant war). That is the stark choice. Only Vladimir Putin seems to counter the latter and for that is pictured as the enemy. We need to take heed of democracy and indeed ensure we have the ability to hold the politicians to account and under the curren media laws that is not going to happen . Milliband suffered as he suggested reigning in Murdoch and his cronies by changes in ownership legislation. to curtail the magolamaniacs who own far too much of the media and thus control the perception of what is going on. As in my last item I told you to VOTE now I urge you to be vociferous if you feel they do not keep thier word. It only takes a couple of dozen votes in parliament on a vote of no confidence to force another general Election . That should be a reality check for every PM! Growing the economy is the key. War hides the economic issues under the cloak of patriotism as in second world war rationing! They are trying to do the same as the downturn in economy may well be more cataclysmic than they are telling us! A world war with again someone picked to be the enemy hides THIER MISTAKES, GREED AND DOWNRIGHT CORRUPTION. We become the cannon fodor to use an age old expression. You can bet your last buck the big guys will be safe in thier luxury underground bunkers they have been building – look up google- over past decade. The next big story will be Europe and a pro euro stance in the media bar none! So speak up but do you homework first nothing you see after all is what it seems . What you see is not what you get! An Assembly atop the Mound!